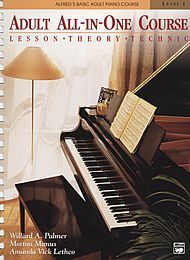 Here is an introduction to a piano method book called Alfred's Piano Course. This piano sheet music book is a favorite. There are 3 main categories in this piano course. The Adult All In One course has one book per level. All of the lesson, theory, recital, and song favorites are all included in one book. You can get a CD to go along with the lessons. The book/CD combination gives you a CD to go along with the book. Include the apostrophe if you use the s in alfred's. On any main piano course page, above the piano course images, there is a Quick Links menu that may say Level 1A, Level 1B, Level 2, or Level 3, you are able to view descriptions of each piano course when you click on the text Level. A paragraph and title of each piano book will show up through which you browse. For example, go to Alfred's Basic Piano Course page to find Quick Links. Here are links to each Alfred's Piano Course.